We particularly liked the rubberized grips, and a nice touch with this one is a 2200 mAh battery. In our time we found MOGA Pro Power is the best portable gaming Controller for a variety of needs. 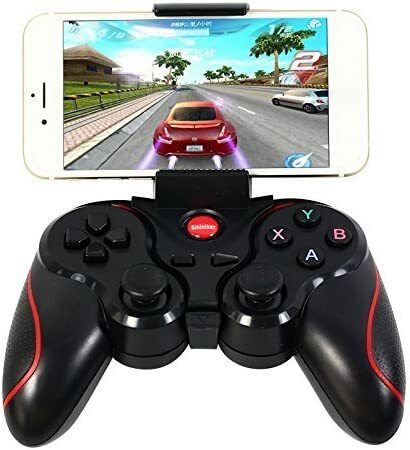 Mobile gaming has never been so popular, so why not invest in a Bluetooth game controller that will let you enjoy your leisure time on a big screen or at ease. The popularity of mobile gaming has never been higher and there’s a massive choice of Android games available. The latest mobile games on high-end smartphones and tablets come very close to the gameplay and graphics quality of console and PC games, and although many mobile games such as platform games, racers, shooters, and RPGs, are designed for the use of virtual buttons on the touch screen of a device, using an external controller offers a vastly improved experience. An affordable gamepad for just about $20 that does rings all the loaded with all the bells and whistles. 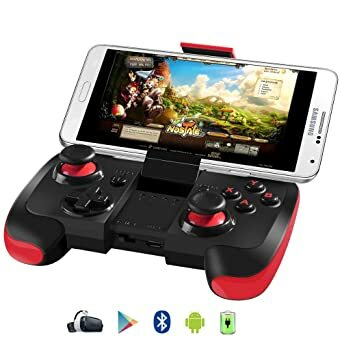 Many mobile games now include support for gamepads and therefore Bluetooth gaming controllers are a popular addition for many avid gamers, with some feeling as good as console controllers. Such devices employ Bluetooth wireless technology using radio waves to seamlessly pair to your mobile device. This avoids those annoying trailing wires, while another benefit is that having a physical controller in your hand can offer a more authentic and immersive feel to gaming on a mobile device. There is numerous option available on the market, offering different features for different needs. Factors to consider when making your choice include price, form factor, build quality, portability, and button layout, and some are also compatible with PCs to further extend your options. 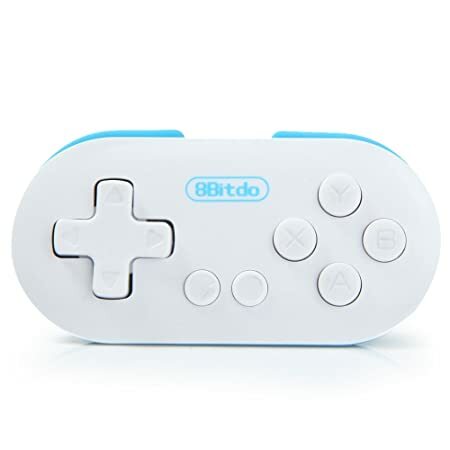 If you have decided that it’s time to invest in an external controller, why not check out our choice of some of the best Bluetooth Android game controllers on the market. We particularly liked the rubberized grips, and a nice touch with this one is a 2200 mAh battery that means you can charge your device at the same time as you’re enjoying your gaming. Last but definitely not least is the MOGA Pro Power, which enables a precision gaming system for your Android device. This controller not only has a built-in smartphone holder featuring S.M.R.T. Lock technology, but it also comes with a tablet stand as well a handy bonus. We particularly liked the rubberized grips, and a nice touch with this one is a 2200 mAh battery that means you can charge your device at the same time as you’re enjoying your gaming. As with many of the controllers here, it has a full set of controls including a D-pad, shoulder buttons and triggers, dual analog sticks, and four action buttons. 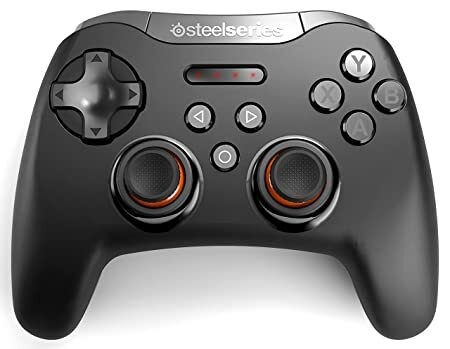 This one looks similar to a PlayStation controller and would be a good option if you feel you’d enjoy using a Bluetooth gamepad but don’t want to spend too much money. Even though it’s an extremely affordable choice it features a clip to hold your device as you’re playing, and the ergonomically designed peripheral has a D-pad, two analog sticks, action buttons, and four shoulder buttons. It features LED lights that blink while it’s disconnected or being charged, or turn to a solid bright light when fully charged. Although the materials are not high quality (hence its low price) it still feels good to grip thanks to rubberized material on the sides, and more importantly, it works well. Compatible with most android devices this is a great choice for budget minded gamers. The Beboncool controller was already decent value and at the moment it’s heavily discounted on Amazon to make it a real bargain. As you’d expect from the price it doesn’t have the best build quality, but it has a compact design that would suit gamers who are more concerned about the portability factor. It packs a built-in 350 mAh battery that should last for between 5 and 8 hours of gaming. A highlight with this one is the built-in smartphone mount that neatly folds out from the center of the controller where there’s a microUSB port for charging and a mode switch. Beboncool aimed at Android users and it has a home/reset button as well as start and select buttons, D-pad, ABXY buttons, two joysticks, and four shoulder triggers. 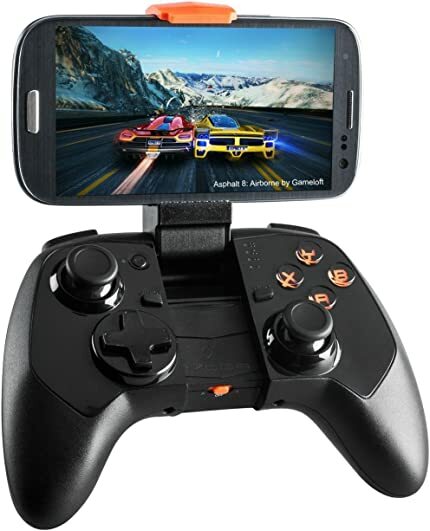 A precise and responsive gaming experience is on offer with this solid Gaming Controller for android. 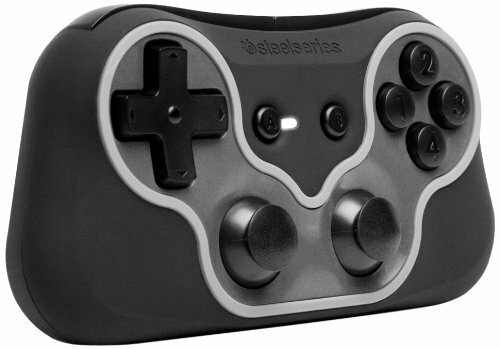 There’s no doubt about it, the SteelSeries Stratus XL is one of the most appealing gamepad available. It feels nicely solid in the hand and although at first glance it’s similar to an Xbox controller, the button layout is more akin to a PlayStation controller. 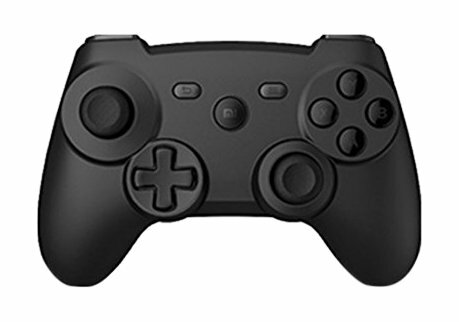 A precise and responsive gaming experience is on offer with pressure sensitive buttons, a D-pad, two joysticks, ABXY action buttons, two shoulder buttons and triggers, and three unique buttons, and it can be used with Android devices and PCs. It works smoothly and offers good battery life (claimed to be more than 40 hours with 2AA batteries). Features include a dedicated on-off slider switch and pairing button, and 4 LED’s. Unfortunately it doesn’t have the convenience of a holder for your device, but otherwise, it’s almost perfect. This Android-targeted controller has a middling price tag and can also be connected to non-Bluetooth PCs via a wireless 2.4Ghz dongle. It supports Bluetooth 4.0 and features a 32-bit high-speed MCU chip. The GameSir G3s uses a built-in 600 mAh rechargeable battery, and one battery charge should get you a full 18 hours of playing time. The usual controls are all here, with a floating D-pad, start and select buttons and turbo and clear buttons in the center panel, and LED lights behind the ABXY buttons. It has pressure sensitive analog triggers, double shock vibration. An optional clip mount also available to hold your smartphone. 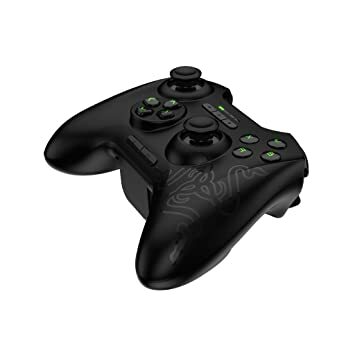 This great value, well-made robust controller is made from toughened material and features dual-motor vibrators and a 3-axis gravity sensor for superior gameplay. It has a humanized button layout, D-pad with four positioning balls for accurate turning, and three buttons in the center, which are Back, Menu, and a Mi button for pairing with Android devices. It also features low power consumption with an energy saving automatic standby mode after 5 minutes of non-use. Pressure testing shows that the device can withstand more than one million button presses to last at least 5 years. It supports Bluetooth 3.0 and is compatible with all Google interface and Bluetooth devices, and it can be connected automatically with just one press. As well as working with Android smartphones and tablets it’s also compatible with Android TVs and set-top boxes. This is one of the most expensive of our choices but many buyers think it’s well worth its price. However, it doesn’t perhaps feel or look quite as good as it should although it performs really well. It’s compatible with Android devices and PCs and comes with a game clip to hold your device. 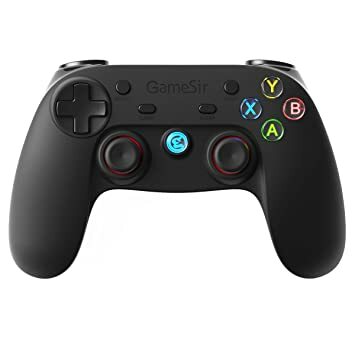 It features precision controls with 4 hyper-responsive action buttons, two shoulder buttons, two triggers, and 2 analog sticks, and it also has a back and home button for Android OS integration and three additional buttons in the center. It can be used with Bluetooth or connected via USB and features a snake design, which is something that might not suit everyone. If you are looking for a compact controller and don’t mind a pretty hefty price tag for it, this one is hard to beat. It’s smaller in size than the SteelSeries’ Stratus XL above, so it can easily be slipped into a pocket. Nevertheless, it still has a premium feel, although it’s worth pointing out that cannot be used with every controller-compatible game. It’s fully featured so has two mode-changing buttons, ABXY buttons, a D-pad, and two joysticks, but the design remains slim thanks to slightly recessed buttons. Battery life lasts for around ten hours before recharging, and you can remap all of the buttons by using the SteelSeries Engine app. This controller also features auto power save to turn it off if it’s been idle for over three minutes, and light indicators for pairing and switching across different device platforms. One drawback is that there’s no phone mount support, but overall the quality of this gadget could be worth the money depending on your needs. 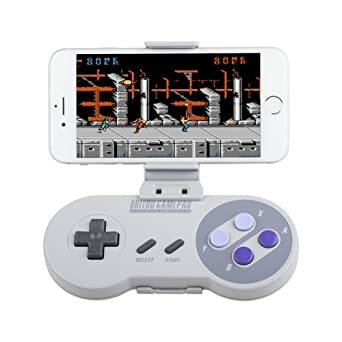 If you love the retro look you’re likely to love this Bluetooth gamepad that will remind you of the classic Super Nintendo controller. It may offer a touch of nostalgia rather than a modern appearance, but looks are deceiving as it’s great to use for retro gaming and has responsive buttons. The 480 mAh battery will give you up to 20 hours of gaming and the controller can be connected either by Bluetooth or via USB so will suit many different devices. It features a D-pad, 4 action buttons, left and right triggers, and start and select buttons. We’ve already mentioned an 8BitDo controller and this also has a SNES format. However, this is possibly the smallest gamepad around and in this case small is beautiful. In fact, it’s so small that you could keep it on a key ring with your other keys and it also has a handy wrist strap. It’s very affordable for what it offers and it can support multiplayer use, has tactile buttons, and excellent battery life with an 180 mAh battery that can last for 20 hours. The choice of gaming controllers is vast but our selection offers something for everyone, whether you’re looking for an affordable option, one that offers good battery life, portability, or want a great all-rounder with good build quality. The devices listed here have a variety of features, highlights, and price points to suit every pocket, so if you’ve been thinking of diving in, this could be a good time to do so. If you have a favorite Bluetooth game controller for Android that we haven’t included, do let us know by sending a comment.